Wishing you all the best with your foal(s) this year HB!! Anyone know when Zenyatta is due? I'm fairly hyped about this years foal. zen was a pretty late cover if I remember? i'm pretty hyped too, but I bet it'll be towards the end of the season and i'm impatient dangit. Apparently she was bred on May 2, so should be early April-ish assuming the first try was successful. Can't wait to see that baby. Good luck to you, and I cant wait to see! Say hello to our first foal of 2017! Agave Kiss gave birth to this Medaglia d'Oro colt in the wee hours of January 3. Congratulations to all of our Profoal Partners 4, LLC members! He's an early contender for "cutest.". For being only a day old, he's a strong-looking boy. They must be very happy with him. BaroqueAgain1 wrote: For being only a day old, he's a strong-looking boy. They must be very happy with him. Strong and even at that age, the colt has a nice conformation. Lovely shoulder. 1st foal for the G1W mare and 1st foal of 2017 for the farm. Those War Front babies are so cute! Kakadu and her American Pharoah colt again. Where are the Honor Codes! Waiting on pins and needles over here! serenassong wrote: Where are the Honor Codes! Waiting on pins and needles over here! If they're anything like their daddy, they're gonna wait till the very last minute. 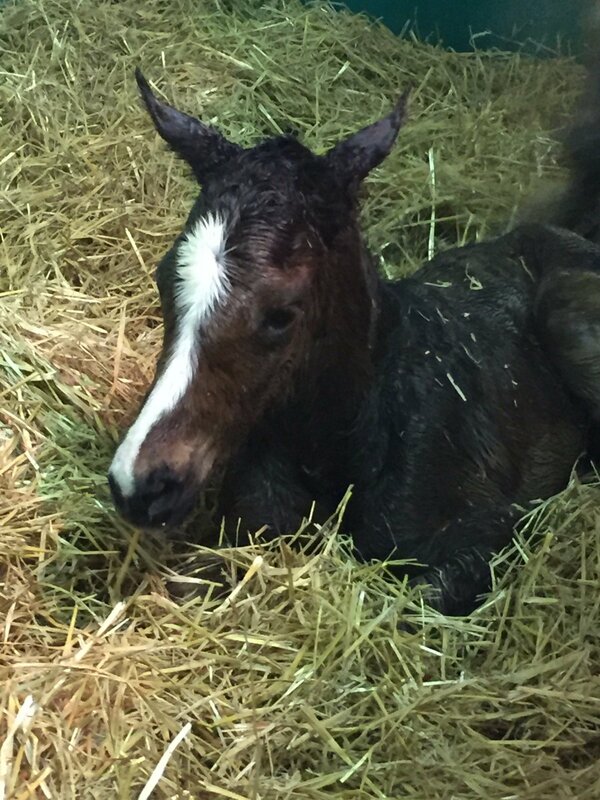 Honor Code's first foal was born this morning at Cobra Farm! The filly is out of the stakes-placed mare Table Three Ten (El Prado). His head looks like daddy.